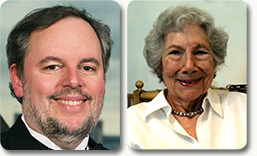 Two longtime GSA members have been honored with the Albert Lasker Basic Medical Research Award. Stephen J. Elledge and Evelyn M. Witkin were recognized for “discoveries concerning the DNA-damage response—a fundamental mechanism that protects the genomes of all living organisms.” Lasker Awards are considered to be among the most prestigious in biomedical research. Since 1945, the Lasker Awards have recognized the contributions of scientists, physicians, and public servants who have made major advances in the understanding, diagnosis, treatment, cure, and prevention of human disease. Lasker Awards often presage future recognition by the Nobel committee, so they have become popularly known as “America’s Nobels.” Eighty-six Lasker laureates have received the Nobel Prize, including 44 in the last three decades. Both Elledge and Witkin have previously been honored with GSA awards. Congratulations! Albert Lasker Basic Medical Research Award, 2015. Hanae Armitage, “Lasker prizes recognize Ebola response, DNA damage, and cancer research,” Science Insider, September 8, 2015. David Cameron, “Geneticist Stephen J. Elledge receives Lasker Award,” Harvard Gazette, September 8, 2015. Robin Lally, “Rutgers Professor Emerita Recognized for Contribution to Field of DNA Repair,” Rutgers Today, September 8, 2015.